Our adult book buyer Lori Feathers facilitates an interesting and lively discussion about a fiction or non-fiction title each month here at the store. Come and share your opinions about the book and glean a deeper or different understanding of it from other readers. All are welcome! 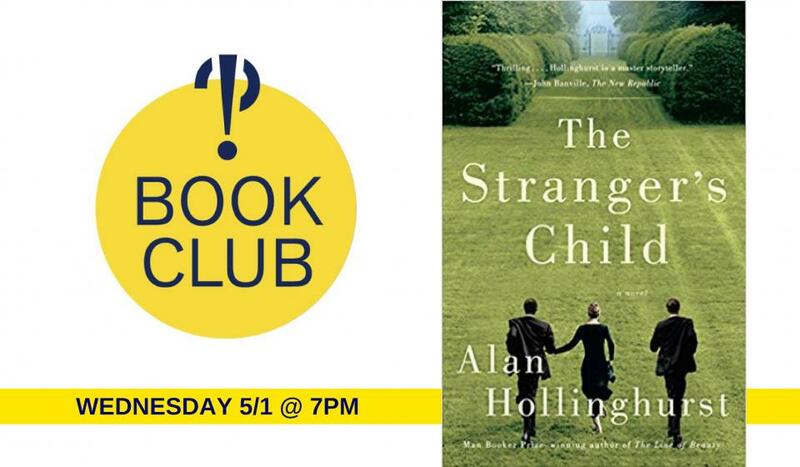 Our pick for May’s book club is The Stranger’s Child, a National Book Critics Award finalist from the Man Booker Prize-winning author of The Line of Beauty and The Sparsholt Affair: a magnificent, century-spanning saga about a love triangle that spawns a myth, and a family mystery, across generations. In the summer of 1913, George Sawle brings his Cambridge schoolmate—a handsome, aristocratic young poet named Cecil Valance—to his family’s home outside London. George is enthralled by Cecil, and soon his sister, Daphne, is equally besotted by him. That weekend, Cecil writes a poem that, after he is killed in the Great War and his reputation burnished, will become a touchstone for a generation, a work recited by every schoolchild in England. Over time, a tragic love story is spun, even as other secrets lie buried—until, decades later, an ambitious biographer threatens to unearth them.